Once in a while, you read, see, or hear something that sticks with you. At the moment, the particular instance of this that concerns me is out of the pages of the March 2011 edition of White Dwarf. It is Jervis Johnson’s column on dice. I had found the article discussing dice and their relationship with the gamer interesting at the time. However, when going back to re-read it before writing this article I was surprised that I had read it about a year and a half ago. It really struck a chord with me, which is quite indicative of my connection with dice as a GM and gamer. Yet, dice have been around long before modern tabletop RPGs and war-games emerged. In fact, the earliest dice discovered by archeologists are about five thousand years old. These dice were made of cattle ankle bones, which is where the term “knucklebone”, sometimes applied to dice, emerged from. Dice predate other tools such as the wheel and metal implements by hundreds if not thousands of years, despite their only use, even then, being related to basic games. Dice are seen throughout history, being not only an ancient tradition, but also a fairly common and constant one. The romans used dice, which can be seen in museums today. In Johnson’ article he discusses how interesting it is that modern dice (he spoke only of d6s, the most common kind of die in history and in his area of focus, Games Workshop games) is identical to these ancient dice, even having each opposing side equal seven. 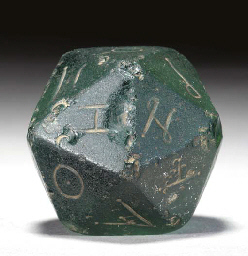 However, examples have also been found of Romans using polyhedral dice such as the d20. So, it is possible that the connection with dice felt by myself and other gamers is not due to our being gamers. Maybe it is a human condition that leads us to connect with dice. We certainly do connect with dice. When I try to think of a single symbol of D&D, it is the dice, the d20, the d4, and the other polyhedral dice. I certainly don’t think of the models, those are optional. The character sheets are documents, everything is written out on them. They do not encompass the whole game in an image like a symbol should. The GM, players, sourcebooks, ect are numerous in their appearances, leaving no uniform image to be a symbol. But the dice, they represent this hobby. When I made the header for this blog, I knew dice would need to be in it from the start. Determining the background was more difficult, but the dice just felt right. They are what one thinks of when envisioning what image is definitive of the hobby. A prime example of the importance of dice as an image attached to tabletop gaming can be seen in the work done by my friend behind Stone Cold Creations. 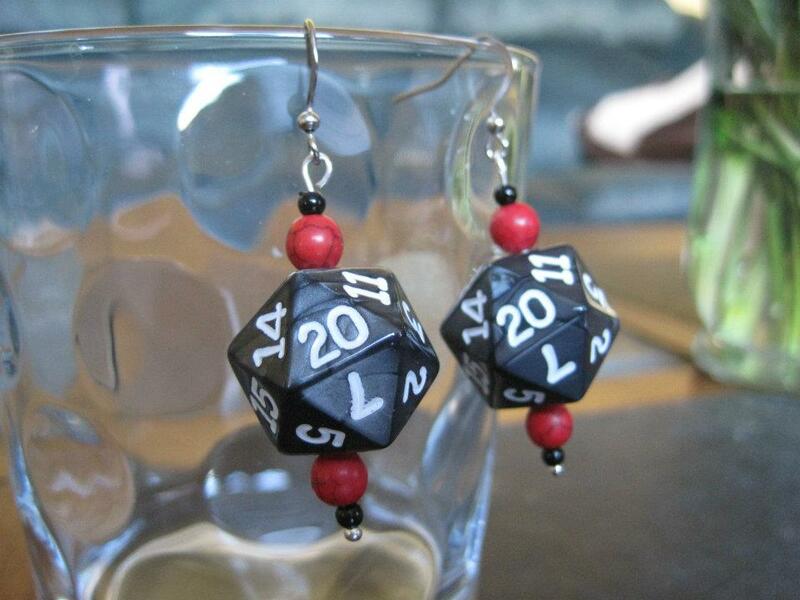 She takes the polyhedral dice used in this hobby and turns them into jewelry. Necklaces, earrings, key chains, all made of the very dice used in the games. They sell to gamers, and by wearing them you are saying “I play or am a fan of table top rpgs.” Wearing the dice makes sense to patrons of Stone Cold Creations because the dice represent the game or hobby and all that encompasses. The same concept is behind numerous designs I have seen upon clothing, like the Thinkgeek design seen below. Again, the focus falls upon the dice as the symbol of the gaming hobby. Evidently dice represent this hobby to those of us interested in it. However, the text that accompanies the image in this Thinkgeek design gets at another level of our connection with these plastic polygons. 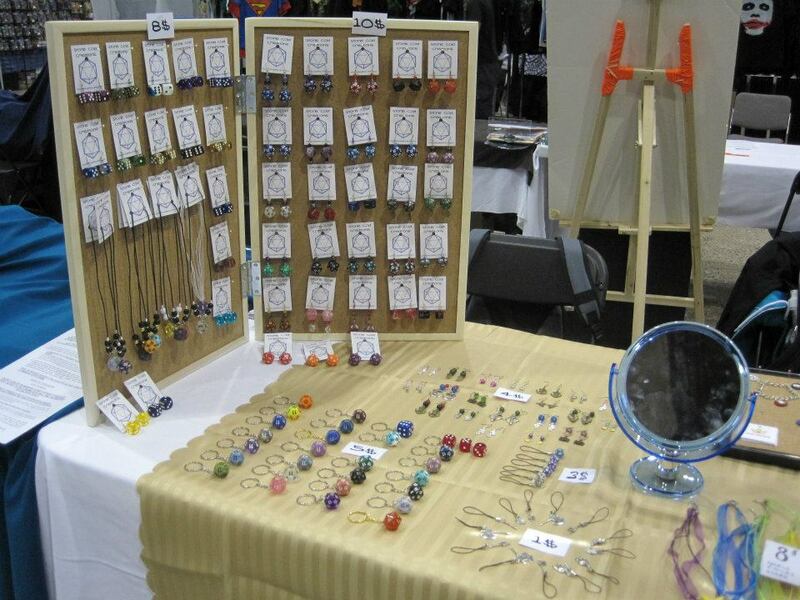 A view of Stone Cold Creations’ dice jewellery. 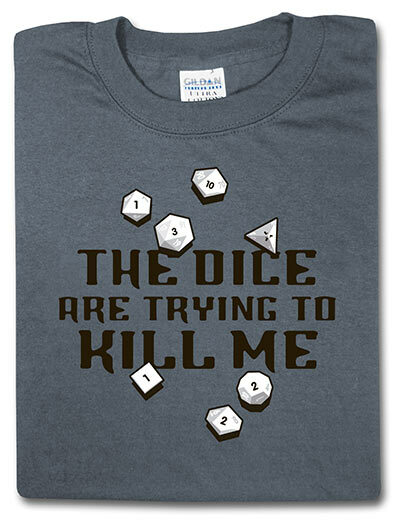 “The dice are trying to kill me” is the phrase upon the aforementioned shirt. The humour there is interesting, as many a gamer can relate to that sentiment, even though dice have no sentient will. Yet, if you watch a game of D&D, Warhammer, or even at times simple board games you will see that gamers do not approach dice as if they were simple plastic tools with fixed probability factors. Gamers are downright superstitious when it comes to dice. It begins with the common concept among gamers that there are bad or good dice. After a dice rolls low several times in a row, some players will discard it, thinking it to be unlucky. That die is trying to hurt their chances of victory. Meanwhile, a dice able to roll high numbers consistently will be used as a lucky die. Some players believe in rolling a die before a game to “get all the ones out”. Others would say doing that is “wasting all the sixes”. I recall a friend telling me about a d6 which consistently rolled ones during a game at a local hobby shop. In response, the staff and players took it out back and dropped a cinderblock on it to destroy the unluckiest dice they had seen in some time. However, when the dust cleared, the dice remained intact while the cinderblock had shattered. When they rolled it again, the onetime cursed die rolled nothing but sixes. Logic may tell us that the player did not teach the die a lesson, yet, sure seems like that dice decided it wanted to live and got its act together. Players saw the die acting as a human might. More obvious superstitions also are common amongst gamers. Some prefer dice of a certain colour, or believe a rounded edged die will roll better than a straight edged one. There are players I know who dislike rolling d20s made to be Magic the Gathering life counters because, despite being d20s with an equal chance of rolling any number, they believe that the different placement of numbers on the faces and more rounded corners produce unluckier rolls. I personally have found myself preferring certain dice to others (a good looking die just rolls higher!) but I will also admit to spending a decent amount of time attempting to determine the ideal surface upon which to roll dice. I wanted something not to hard or soft with some give to allow good rolls. Johnson mentions in his article his belief that rolling da die alone almost guarantees a low roll. He says he will do anything to roll several dice at once. However, possibly the best example of how superstitious gamers can be in regards to dice was published by the Games Workshop not long after Johnson ran his article. 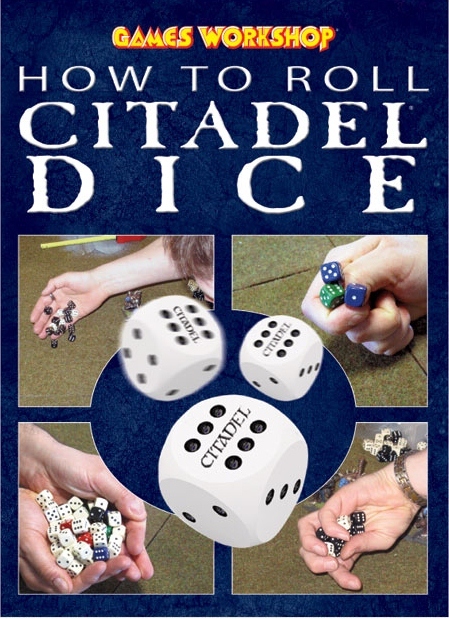 Behold, How to Roll Citadel Dice, a “126-page full-colour guide containing everything you ever need to know about rolling dice to improve your battles”, to quote the books promotional materials. The Games Workshop knows its games well enough to expect decent sales of such a volume, despite the fact that beyond weighting them there is no way to roll a die to guarantee sixes or any other number is rolled. Yet, I will admit, I would be interested to take a look at the book and see what they suggest, even if I know man cannot control a die. That very knowledge gives rise to another common gamer belief surrounding dice, the idea of the dice gods. Admittedly, this suggestion is often made in jest, but when one rolls the dice, there does seem to be some control. As a player and a intelligent individual, you know you lack any control over the dice, despite what a book might try to tell you. Yet, when you watch a player roll four critical hits off straight natural 20s (I wish I was making that up), or when four d6 come up all sixes, it is easier to believe a higher power influenced the dice than believe in the astronomical chances of such an occurrence. We cannot understand what chance led to such an outcome. I personally find dice gods preferable to other forces controlling the dice. I am a big believer in how useful technology can be on the table top. However, digital dice? I still do not trust them. I know normal dice cannot be physically perfect. Even with factory manufacturing there will be imperfections that could cause a die to be less than 100% random, giving certain numbers a minuscule, yet still present, higher chance of coming up. Meanwhile, a friend familiar with computer programing, and general research, tell me that modern random number generators can be quite sophisticated, selecting numbers based upon factors such as the milliseconds at the moment, atmospheric noise, and though complex algorithms. To my understanding, these methods can be more reliably random than physical dice. Yet, I still do not trust digital dice, entirely because there is a power governing those dice that someone understands. While I may not fully understand the math and computer programing at work here, someone understands these things and could use that knowledge to manipulate the outcomes. I prefer to let the dice gods govern the dice. At least I can be confident nobody can manipulate them. Dice must be random, and that random nature is not something we can understand. At this point in time and certainly on the gaming table, I do not think we should understand that random chance. Ahh, but you say, those same powers you fear in digital dice, namely the mathematics of probability, govern the physical dice. I respond by saying that humans might be able to use that to their advantage, however, as far as I know, we cannot yet predict or manipulate those probabilities so as to roll those four 20s, at least without weighting the dice. In that respect, probability is the same as the dice gods. Both give you a feeling of understanding of the chances involved with the roll of a die, yet neither can predict the outcome of every last roll. This is good. After all, why do we use dice in our games? They are a tool that allows games like D&D to have a truly random element. In real life and in stories luck, fate, or chance, all play a role. As we cannot yet predict an outcome perfectly, these random elements are, and have always been, a fact of human life. In a role playing game, we need these elements in order to relate to the story, and the element of chance adds the unexpected. Some of the greatest stories from games come from that unexpected roll that changed everything around. I certainly like to tell the tale of the player who rolled a 1 on his d20, a critical fail. He cut down another player as a result, to the laughter of the group. My point is that dice allow us to general chance or luck in game. By definition, chance is something humans cannot control. Chance is an unknown, and that is why it is so fun and fascinating. Dice allow us to generate instances where chance determines the outcome. As a physical tool used to introduce chance to a situation, often a game, we attach dice to that unknown element. It is generally accepted that we mortals have an issue with the unknown. We like to explain it. But you cannot explain chance. We try. Probability is one attempt and the dice gods are another. We explain the rolls, the chance results, that we cannot explain with superstition and faith. Gamers, it seems, are no different than ancient Greeks having faith in the existence of Zeus to understand a thunderstorm. Today, we have learned what a thunderstorm is, and understand the science behind it, but we do not yet find ourselves able to explain chance. Each roll of the dice is a mystery. I think we remained fascinated with it as a result, and we try to explain it, even though our answers lack the concrete nature of the science that explains the lightning to us. In our attempts to explain chance, we focus on the die as the representation of this unknown. Greeks focused on the thunder and lightning, what they could see. Chance is a concept, and a fairly nebulous one. A die, however, is easy to understand, and it represents and explains chance perfectly. Our fascination with the unknown element of chance is put on the die, and we focus on the plastic. We then attempt to explain how they work, and our superstitions are born. It was easier to understand Zeus than it was to understand a thunderstorm, and similarly, it is easier to understand that a die can be good or bad that understand the complete random element that is chance. We prefer the human element to the random one, so that is what we see in our dice. If the dice have human elements, if they can deliberately screw you over or be trained by cinderblock beatings to behave. More importantly, we can understand them, and can write books about how to work with them. Dice represent the unknown element of chance then, and to understand chance we invent ways of understanding dice. We explain the random element, the unknown, away with faith in dice gods and superstitions based on the concept that dice have rules. It is how we humans understand what is beyond us. Even the explainable yet complex we like to simplify. D&D is a difficult game to explain to the uninitiated, and we all know it is easily misunderstood but non gamers (remember folks, D&D promotes Satan worship and causes numerous deaths), so we find a simple symbol that encompasses the game. We can wear that symbol proudly, and it is the die, the crux of our hobby. By now I hope I have made it clear that we are fascinated with the dice. I certainly am. So I think there is no more fitting symbol of this hobby. The die is the table top gamer’s essential tool, the unknown possibilities glazed in story, belief, imagination, and other aspects of that human element. Wear it proudly.